Holy place is a place that people consider holy and/or a religion considers to be of special religious significance. A holy place may be visited by visitors, known as pilgrims. Bodh Gaya, India, is the most important religious site and place of pilgrimage, the Mahabodhi Temple houses what is believed to be the Bodhi Tree where the Buddha realized enlightenment and Buddhahood. Kushinagar, India, is where the Buddha attained Parinirvana after his death. Lumbini, Nepal, is where Queen Maya gave birth to Prince Siddhartha Gautama. Sarnath, India, is the deer park where the Buddha first taught the Dhamma after realizing enlightenment. There are various other locations in India and Nepal associated with the Buddha, and there are holy sites located throughout Asia for each Buddhist tradition, for instance in Afghanistan, Cambodia, China, India, Indonesia, Japan, Laos, Myanmar, Nepal, Sri Lanka, South Korea and Thailand. Lhasa in Tibet contains many culturally significant Tibetan Buddhist sites such as the Potala Palace, Jokhang temple and Norbulingka palaces. In Christianity, the holy places are significant because they are the place of birth, ministry, crucifixion and resurrection of Jesus, the Saviour or Messiah to Christianity. Jerusalem is believed to be the site of some of Jesus's teaching, the Last Supper, the subsequent institution of the Holy Eucharist as well as his entombment; Christians believe he was crucified on a nearby hill, Golgotha (sometimes called Calvary). It contains the Church of the Holy Sepulchre, Via Dolorosa, Mount Zion and the Dormition Abbey, and Gethsemane (with Mary's Tomb and the Church of All Nations). Nazareth is Jesus's hometown and the site of many holy places, including the Church of the Annunciation and Mary's Well. Jericho, along the road to which was the location of the Good Samaritan's charity. Sacred grove, site of Joseph Smith's First Vision. Cumorah, burial site of the Book of Mormon. Adam-ondi-Ahman, the site where Adam will visit at the Second Coming. Holy places of Confucianism include Temple of Confucius, Cemetery of Confucius and the Kong Family Mansion in Qufu, Shandong Province of China. 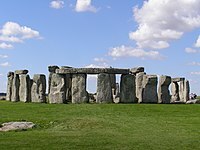 Stonehenge is a site of religious significance in Neo-Druidism. Druids perform pilgrimage there, The first modern Druids to make ceremonies at this site is the Ancient Order of Druids. The Seven sacred ancient Holy towns are Ayodhya, Mathura, Haridwar, Varanasi, Kanchipuram, Dvārakā, and Ujjain. Situated on the banks of river Ganges, Varanasi attracts millions of Hindu pilgrims every year. Kailash Parvata in Tibet is revered as the Holy abode of Lord Shiva. Applies to only those places where pure natural water stream/river flows next to the temple, for example Kodlamane Shree Vishnumurthy Temple. The three holiest sites in Islam are the Masjid al-Haram, or Grand Mosque, (in Mecca) ; the Al-Masjid al-Nabawi, or Prophet's Mosque, (in Medina) and Al-Aqsa Mosque in Jerusalem. Every year millions of Muslims from all over the world visit Masjid al-Haram and Al-Masjid al-Nabawi to perform Hajj. Muslims are also required, if able, to undertake a pilgrimage to Mecca (Hajj) (/hædʒ/; Arabic: حَجّ‎ Ḥaǧǧ "pilgrimage") at least once in one's life: it is strongly recommended to do it as often as possible, preferably once a year. Only individuals whose financial position and health are severely insufficient are exempt from making Hajj (e.g. if making Hajj would put stress on one's financial situation, but would not end up in homelessness or starvation, it is still required). During this pilgrimage, the Muslims spend three to seven days in worship, performing several strictly-defined rituals, most notably circumnavigating the Qaaba among millions of other Muslims and the "stoning of the devil" at Mina. At the end of the Hajj, the heads of men are shaved, sheep and other halal animals, notably camels, are slaughtered as a ritual sacrifice by bleeding out at the neck according to a strictly-prescribed ritual slaughter method similar to the Jewish kashrut, to commemorate the moment when, according to Islamic tradition, Allah replaced Abraham's son Ishmael (contrasted with the Judaeo-Christian tradition that Isaac was the intended sacrifice) with a sheep, thereby preventing human sacrifice. The meat from these animals is then distributed locally to needy Muslims, neighbors and relatives. The Western Wall by night. In Jewish tradition, the Temple Mount is regarded as the place where God chose the Divine Presence to rest. Jewish tradition regards the Mount, or the Foundation Stone, as the location of a number of important events mentioned in the Bible, including the location from which the world expanded into its present form, Abraham's binding of Isaac, Jacob's dream, the threshing floor which King David purchased from Araunah the Jebusite, and the location of the two Jewish Temples. Jewish texts record that the Mount will be the site of the Third Temple, which will be rebuilt with the coming of the messiah. The Temple Mount is the holiest site in Judaism and is the place to which Jews turn during prayer. Due to its extreme sanctity, many Jews will not walk on the Mount itself, to avoid unintentionally entering the area where the Holy of Holies stood. The Temple is mentioned extensively in Orthodox services. Conservative Judaism mentions the Temple and its restoration, but not its sacrifices. The destruction of the Temple is mourned on the Jewish fast day of Tisha B'Av, and is remembered on a number of occasions such as in the breaking of a glass at the end of a wedding ceremony. Due to religious restrictions on entering the most sacred areas of the Temple Mount (see following section), the Western Wall, a retaining wall of the Temple Mount and remnant of the Second Temple structure, is considered by some rabbinical authorities the holiest accessible site for Jews to pray. Jerusalem itself is also the holiest city in Judaism, and the spiritual center of the Jewish people since the 10th century BCE. [not in citation given] The Four Holy Cities in Jewish tradition are the cities of Jerusalem, Hebron, Tiberias, and Safed: The Jewish Encyclopedia in 1906 noted: "Since the sixteenth century the Holiness of Palestine, especially for burial, has been almost wholly transferred to four cities—Jerusalem, Hebron, Tiberias, and Safed." The Panj Takht are the five gurudwaras which are revered as the seats of power in Sikhism. 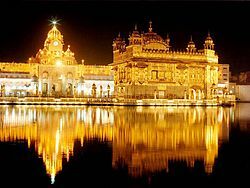 They are all located in India - the Akal Takht Sahib in Amritsar, Punjab; the Keshgarh Sahib in Anandpur Sahib, Punjab; the Damdama Sahib in Bhatinda, Punjab; the Takht Sri Patna Sahib in Patna, Bihar and the Hazur Sahib Nanded in Nanded, Maharashtra. Mount Qiyun, in Huangshan, Anhui Province. ^ "Holy Places of the World". adherents.com. ^ The Buddha mentions these four pilgrimage sites in the Mahaparinibbana Sutta. See, for instance, Thanissaro (1998) and Vajira & Story (1998). ^ "A Video Tour inside the church of the Holy Sepulchre". ^ "Pilgrimages To The Holy Land And Communities In The Holy Land". Retrieved March 30, 2019. ^ Juan Eduardo Campo (2009). Encyclopedia of Islam. Infobase Publishing. p. 281. ISBN 978-1-4381-2696-8.